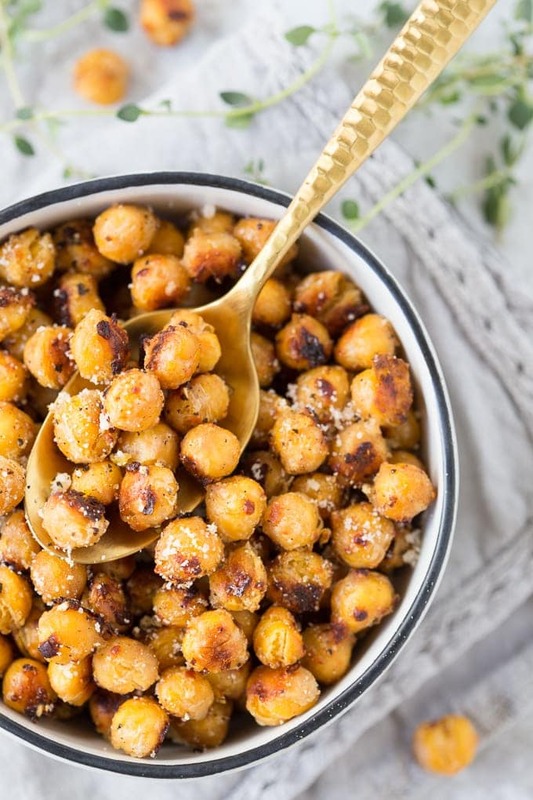 I originally set out to make these Crispy Parmesan Roasted Chickpeas as a topper for a Kale Caesar Salad but they didn’t make it to the salad (oops!). I just couldn’t resist the warm crunchy chickpeas perfectly toasted with olive oil, Parmesan cheese, garlic and a little lemon zest. First it was just a couple of crunchy garbanzos that “accidentally” jumped out of the batch and right into my mouth. Then it just turned into a full on feeding frenzy ..what can I say they are the right amount of savory, salty, delicious, healthy…” oh my, did I really just eat all of those” snack. 2. Drying the chickpeas will loosen some of the skins. Make sure to remove any loose skins before roasting (otherwise they will burn). 3. 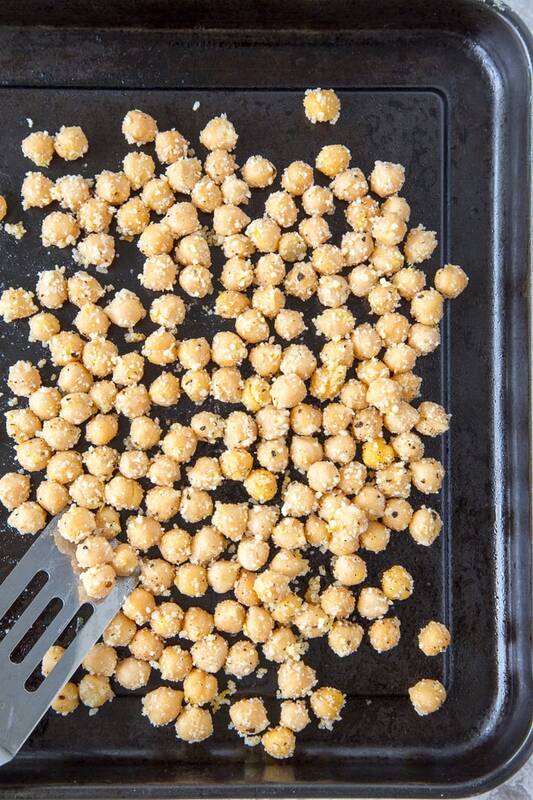 Chickpeas are best served immediately after cooking for optimum crunchiness. They will start to get slightly “chewy” after they have cooled a bit and definitely after they have been stored for a day or two. 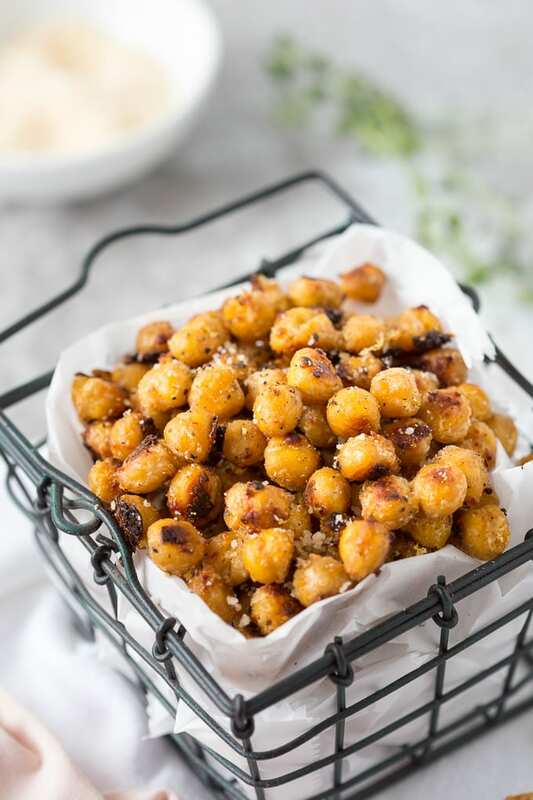 I happen to think they still taste amazing but if you prefer a crispier version, place chickpeas on a roasting pan under the broiler for a few minutes to “crisp them up” again. Recipe Notes: See those brown bits in the picture above? I choose to add the Parmesan cheese (along with the olive oil, garlic powder, lemon zest and salt & pepper) prior to roasting the chickpeas. The cheese will definitely get crispy and turn brown. I like the added depth of flavor but if you prefer not to have the brown bits, hold off on adding the Parmesan cheese until the chickpeas have finished cooking. 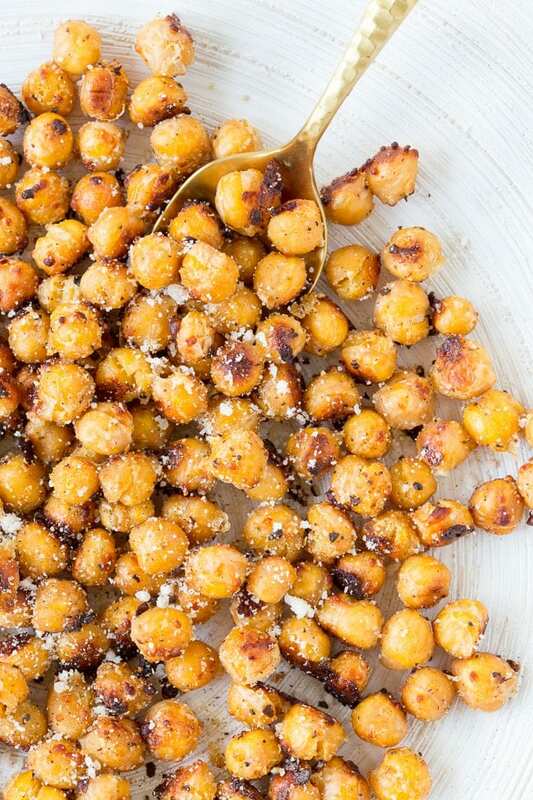 ( equally as delicious, you’ll have crispy chickpeas just no brown crunchy bits). The bottom line: Brown bits, no brown bits…These are going to be AMAZING! Perfect for a healthy snack or to top a salad or soup. Sprinkle with finely chopped fresh rosemary for a tasty twist. Preheat oven to 375F. Line a large baking sheet with parchment paper. Set aside. Drain and rinse chickpeas. Pat chickpeas with paper towels to dry and remove any loose skins (the drier the chickpeas are before cooking the crispier they will be after cooking). 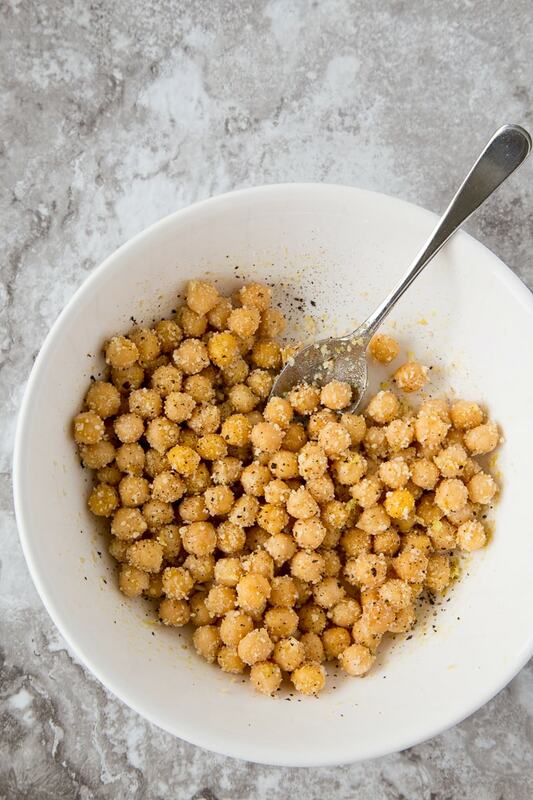 In a large bowl toss chickpeas with oil, garlic powder, lemon zest and salt & pepper and Parmesan cheese. Arrange in a single layer on baking sheet and bake until crisp and light brown ( approx. 45-50 mins) tossing halfway through cooking. Remove from oven and sprinkle with additional grated Parmesan cheese if desired. I choose to add the Parmesan cheese (along with the olive oil, garlic powder, lemon zest and salt & pepper) prior to roasting the chickpeas. The cheese will definitely get crispy and turn brown. I like the added depth of flavor but if you prefer not to have the brown bits, hold off on adding the Parmesan cheese until the chickpeas have finished cooking. ( equally as delicious, you'll have crunchy chickpeas just no brown crunchy bits).